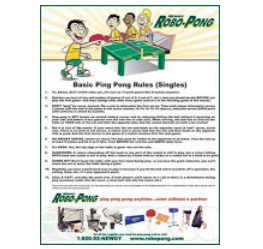 In this Robo-Pong Rules of Ping Pong poster they have summarized some of the most often misunderstood rules for singles play, and put them on a fun poster suitable for framing in your rec-room, basement or ping pong area. 1.1: The left side of the table is for ping pong. The right side is for model making, homework, sandwiches, beer, changing diapers, etc.